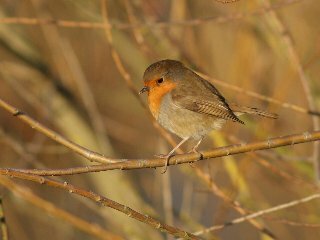 Robin: A winter garden bird you can count on! The RSPB Big Garden Birdwatch was held over the weekend 25 – 26 January this year. This annual winter event gives us a snapshot of bird species, numbers and activity in the UK. Over the years results have built up to show bird population and distribution trends – which are of great help to all organisations involved in nature conservation. The results are now in, with over 7 million birds counted in what is claimed to be the world’s largest wildlife survey! See the Top 10 along with summaries of rarities, which species increased and which decreased on the RSPB Big Garden Birdwatch website. Sign-up for our email news! Our printed newsletter is issued at 4-monthly intervals and so suffers from lack of immediacy. So we are now putting greater emphasis on email, which along with our website, is more flexible in terms of disseminating information. Nottinghamshire Wildlife Trust issues a county-wide monthly email newsletter, and we now send out a monthly South Notts Local Group email. If you are an NWT member living in South Notts please contact Alex Walls (0115 958 8242 or awalls@nottswt.co.uk) to make sure your membership details are up-to-date to receive both items. Wet and windy weather over the winter means there is still plenty to do on our reserves this spring. All our reserve work parties welcome new volunteers! Working on one of our reserves is a great way to do something practical for nature conservation, get out in the fresh area and meet other people. Please see our spring work parties page or download the fact-sheet for details. Our What’s On diary now includes all our spring and summer events, from late March until mid-September. We have a bumper bundle of twelve wildlife walks, taking in reserves in south Nottinghamshire and neighbouring north Leicestershire and featuring birds (dawn chorus), woods, wetlands, wildflowers, butterflies and invertebrates. Plus our spring fair at Ruddington, open-day at Bunny Wood and our AGM and Talk in West Bridgford. Download a printable version of our diary (PDF).